Prosperous NS have been selected as one of 150 schools to participate in an exciting new initiative 'Creative Schools' which aims to put art and creativity at the centre of children's lives. As part of this initiative, the school will be welcoming a Creative Associate, who will work with the school community across the year to develop and implement a Creative Schools Plan. The pupils will be at the centre of this process and will have the opportunity to engage with the Creative Associate in lots of fun and exciting ways to support our school to become an even more creative and arts-rich environment. This week we welcomed our Creative Associate, Aisling Byrne. Aisling is a Kildare based theatre artist and educator who has specialised for a number of years in inclusive drama practice, based at St John of God Community Services and St. Raphael's School. She is the Artistic Director of Run of the Mill Theatre, a Kildare based theatre company for people with special needs and founder of the award-winning theatre company Talking Shop Ensemble. Aisling has sat for a number of years on the committee of the ADEI (Association for Drama in Education in Ireland). 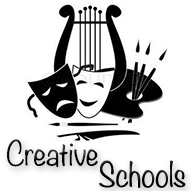 If anyone in our wider school community might be interested in getting involved in our Creative Schools programme please contact Catherine Shanley, our Creative Schools Coordinator.